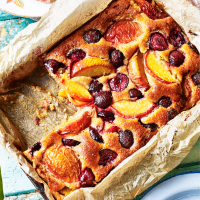 Apricots and nectarines work just as well as peaches in this recipe, as do raspberries. A slice of this cake and a glass of chilled prosecco whisper ‘seize the summer’ like nothing else. 1. Preheat the oven to 180 ̊C, gas mark 4; grease and line an 18cm x 28cm baking tin with parchment. Using electric beaters, beat the butter and sugar until fluffy. Gradually add the egg, vanilla paste and lemon zest. Do not panic if the mixture curdles; adding the flour will solve the problem. 2. Mix the flour with the baking powder and a pinch of salt, and fold through the mix. Then gently fold in the ground almonds. 3. Scrape the batter into the tin and arrange the fruit over the top. Bake for 30-35 minutes, or until a skewer inserted into the centre of the cake comes out clean. 4. Heat the lemon juice and elderflower cordial in a pan and pour over the cake. Serve sliced on its own or with a dollop of natural yogurt.